Hi and welcome to our Blog page. Business is starting to pick up now with young and old customers alike. 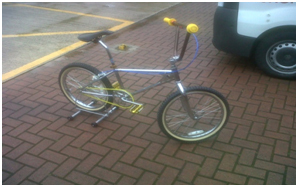 Frame was purchased from a BMX “geek” who couldn’t recognise the frame or forks. We set about polishing the frame and forks up but the CW style bars were shot and painted Metallic Pearl Chocolate Brown and lacquered. The rims are brand new Chrome deadstock. New amberwall style tyres finished off with skull dusties. the Sugino Chro-Mo crank is original, NOS yellow chain and NOS Chrome 18 tooth freewheel. 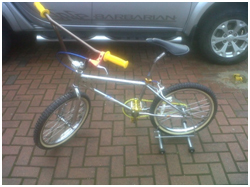 Meng Ying mid school Chro-Mo layback seat post and NOS 80’s racing seat with a bit of padding!!! Nice NOS yellow mushroom grips with a Vuelta MTB lever giving a bit more stopping power to the white 80’s single rear caliper brake from a metallic blue cable. Bike runs sweet, and is offered for sale by application. Offers over £250.00p please.